Just outside the metro of Des Moines sits a quiet plot of land. Wild turkeys and curious deer roam the nearby woods and stream, peeking in on the weddings venue of Country Lane Lodge. Perhaps they wish to be invited to this bridal brunch, seeking out their own personal princess to befriend? Inside the warm glow of the wooden barn wedding venue, a table stands ready. Set with vintage pink tumblrs for spiked punch, and rose & teal china for the croissants, fresh fruit, and other late morning snacks, this setting is perfect for any group of bridesmaids wishing to travel to Europe but with a budget to stay in Des Moines! White pumpkins and fresh eucalyptus add the perfect tones of late fall, and the girls arrive after a morning of pampering to dine, wine, and enjoy some time together. Vintage touches from Lynda’s personal collection and local second-hand stores helped create this perfect brunch. Maybe next time we’ll add in some locally baked goods, or some hot wassail! Getting ready in Des Moines, these women were well taken care of. 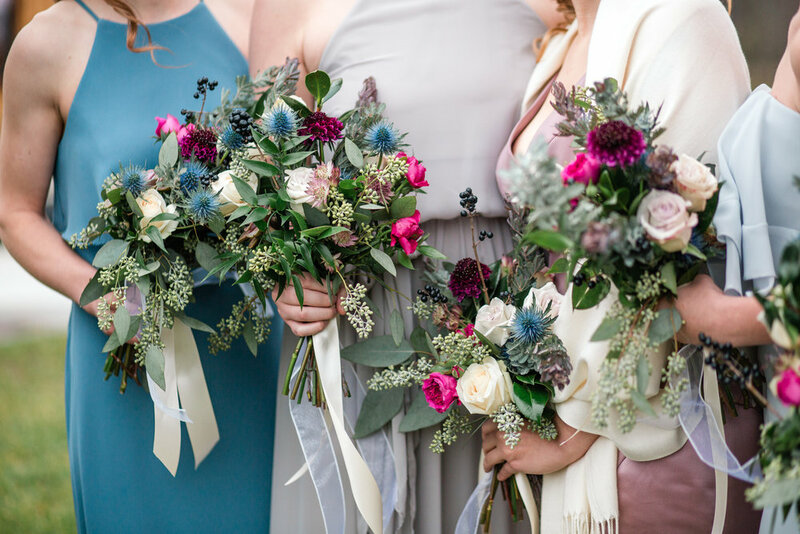 Wedding florist Lynda O’Hara of Lavender Blue Floral offered her experience in creating the perfect November bouquets and flower crowns for this bridesmaid bunch. Des Moines wedding photographer Amelia Renee captured the morning activities with grace. And none of this could be possible without the pampering of Nicole DeMondo on makeup, & Jenn Christianson, hair designer. All of these women would love to work with you!